Upper Sand Canyon Trail, Canyons of the Ancients National Monument, April 28, 2015; May 4 and June 5, 2009; and April 30, 2016. Erigeron tracyi plants grow quickly and become a mass of tangled stolons and tall lanky stems. Upper Sand Canyon Trail, Canyons of the Ancients National Monument, May 4, 2009. 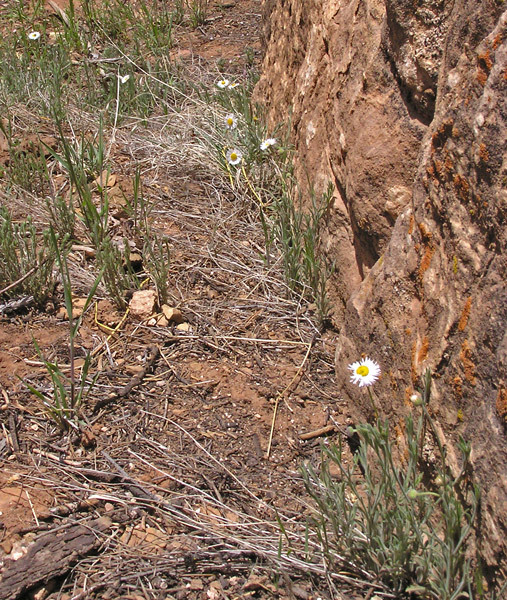 Erigeron tracyi combines characteristics of Erigeron divergens and Erigeron flagellaris. 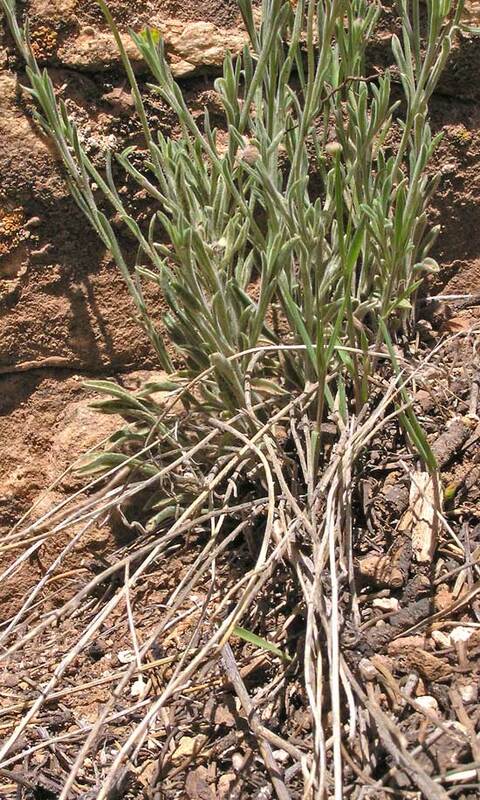 The overall appearance of the plant is that of the former and the stolons (runners) are similar to those of the latter. 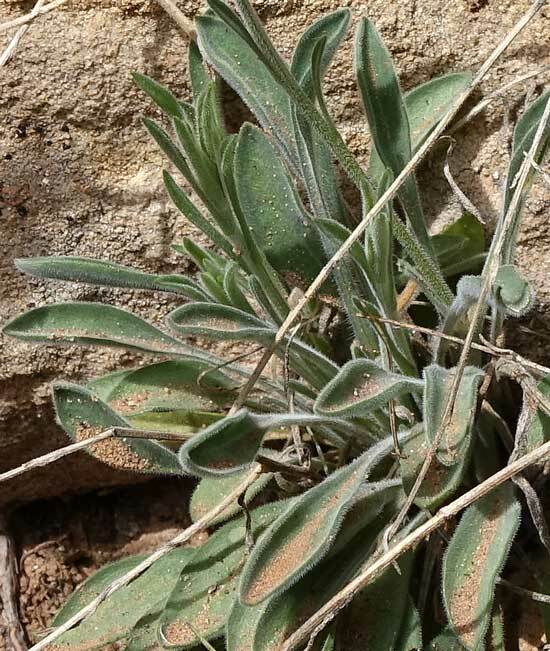 A Utah Flora and Intermountain Flora consider E. tracyi to be a variety of E. divergens, but The Flora of North America, the Synthesis, and Weber consider E. tracyi to be a distinct species. 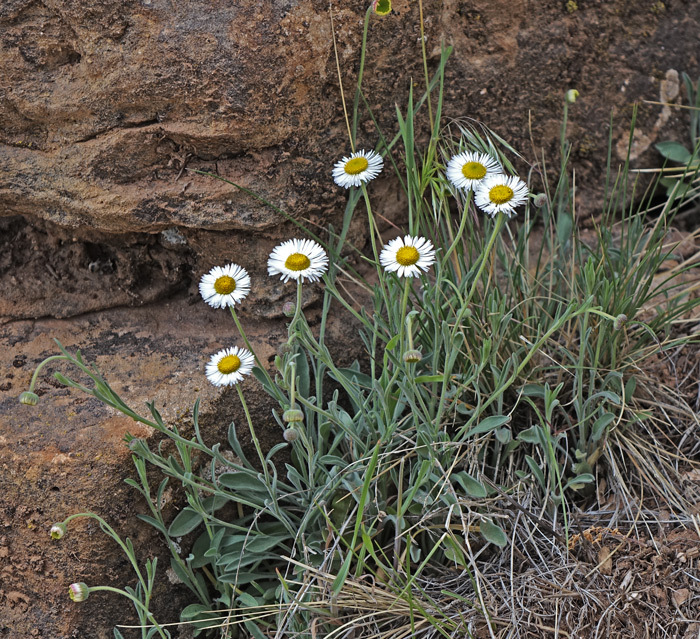 Erigeron trayci certainly has a number of characteristics that are distinct from those of E. divergens: E. trayci is often perennial; E. divergens is annual. E. trayci has long and obvious stolons; E. divergens does not have stolons. 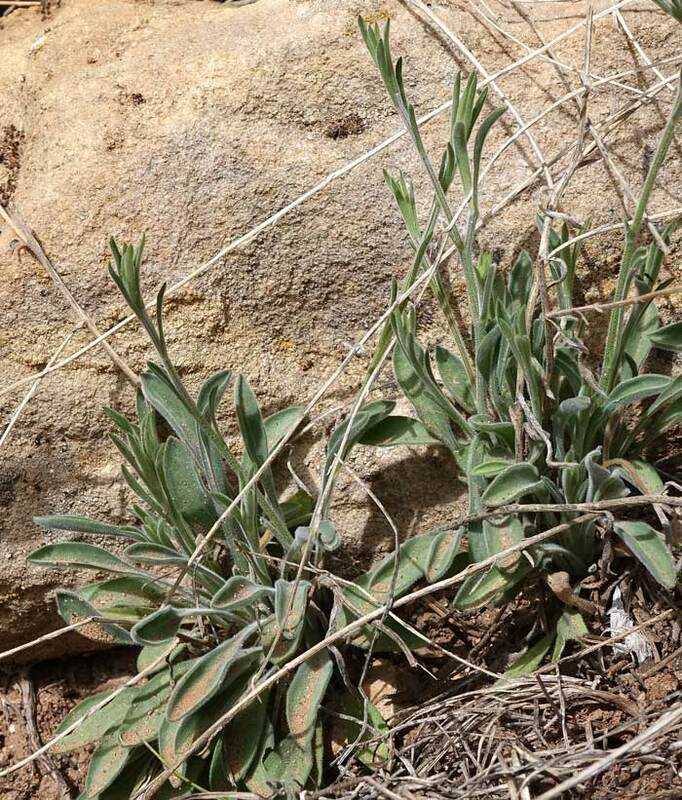 Fendler collected this plant near Santa Fe in the mid 1840s. Gray named it E. cinereum in 1849 and just three years later renamed it E. divergens var. cinereum; Greene named it E. trayci in 1902; and Nelson named the plant E. colomexicanus in 1909. Upper Sand Canyon Trail, Canyons of the Ancients National Monument, April 30, 2016. Basal leaves are crowded and wider toward the tip. Stem leaves are few and narrow. See the 11 o'clock position in the photograph at left and see the second photograph at the top of the page. 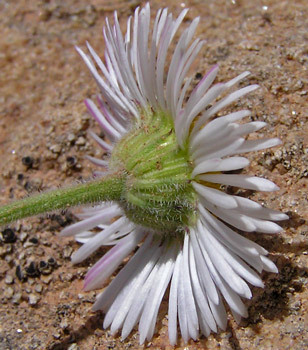 The spreading-deflexed hairiness of the Erigeron trayci is one major characteristic that separates it from E. flagellaris which has appressed hairiness. 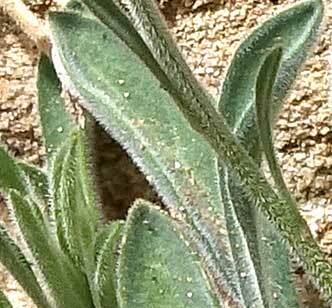 You can see this hairiness especially well in the photograph below along the stem and at the edges of the leaves. Erigeron tracyi Synonyms: Erigeron colomexicanus, Erigeron divergens variety cinereus. 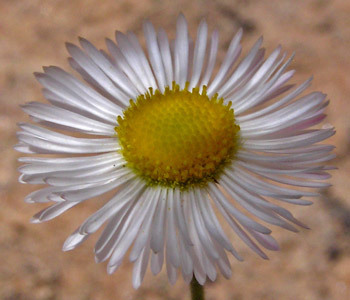 (Tracy's Daisy, Tracy's Fleabane). 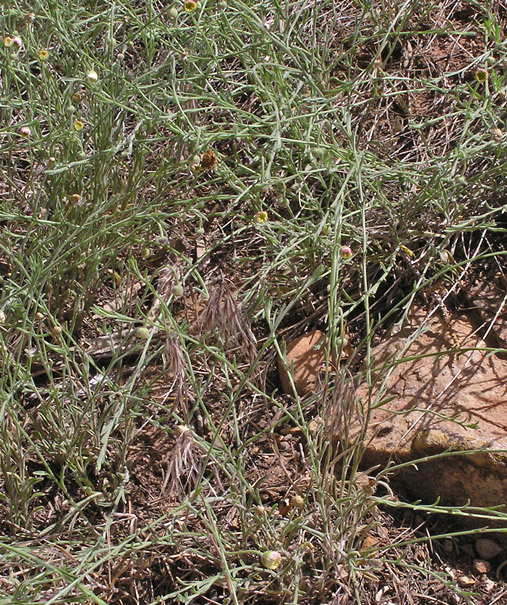 The runners (stolons) of E. trayci are obvious because they are numerous, long, and thick. In addition, they seldomly root at their tips to produce new plants. 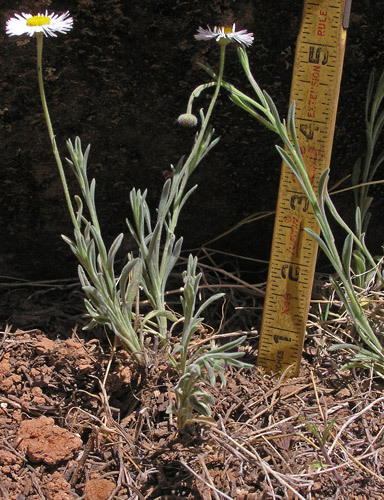 The stolons of E. flagellaris are fewer, shorter, and thinner. They commonly root at their tips producing new plants.